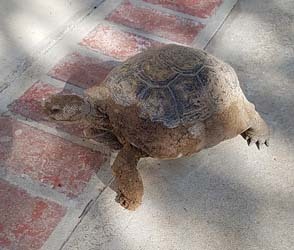 It's been a few years since the untimely death of my baby tortoise, Koopa. I loved that little critter, and was devastated by her death. It took a while, but time heals all wounds, and I was eventually ready to take on another pet. The fact that I was taking in a pet that I already knew made it a lot easier for me to feel ready. 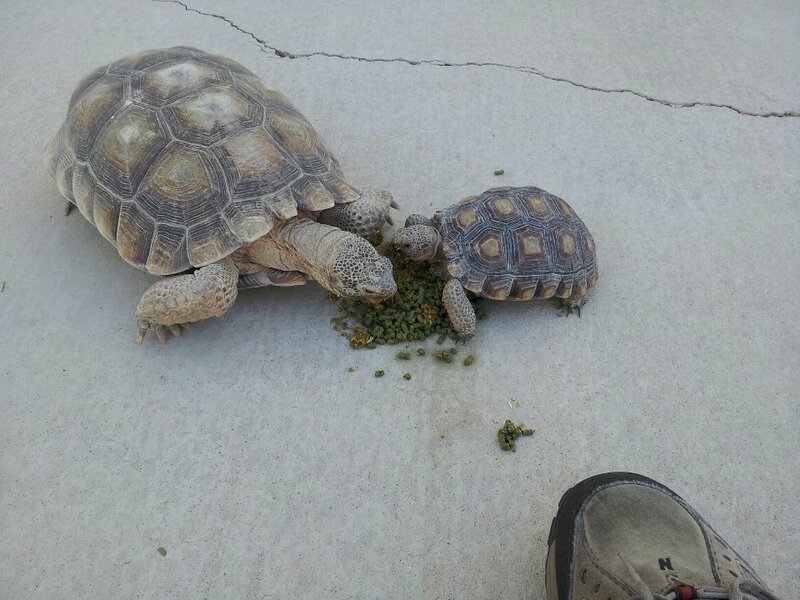 Last summer, I took charge over one of my parents' pet tortoises, named Bubbles. 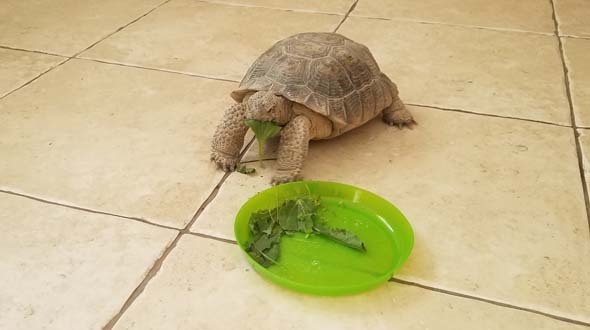 He is the first child of Nipper, a tortoise that I had as a pet since I was about 9 years old. Nipper, sadly, also died a few years ago in another tragic incident, but she still has several surviving children. 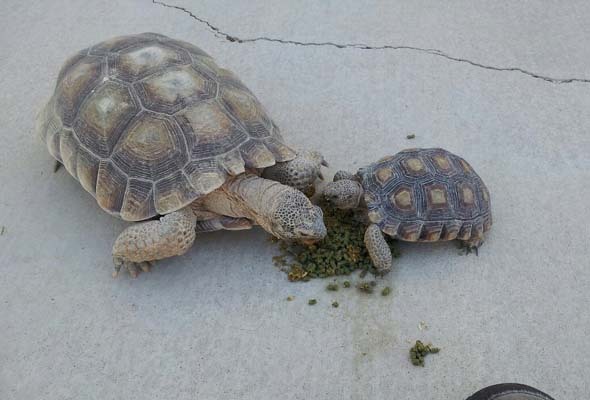 Bubbles [RIGHT] is the first child of my childhood pet, Nipper [LEFT]. Bubbles is 14 years old, and was starting to become aggressive and territorial -- and a little incestuous -- with his younger sisters, so we decided that it was best that we separate him. 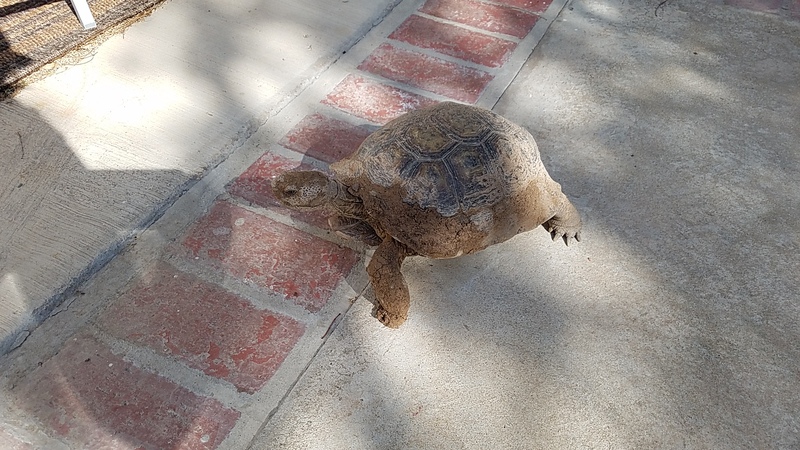 Last summer, we relocated him to my home, and I had to build a large, above ground burrow for him on the side of the house. 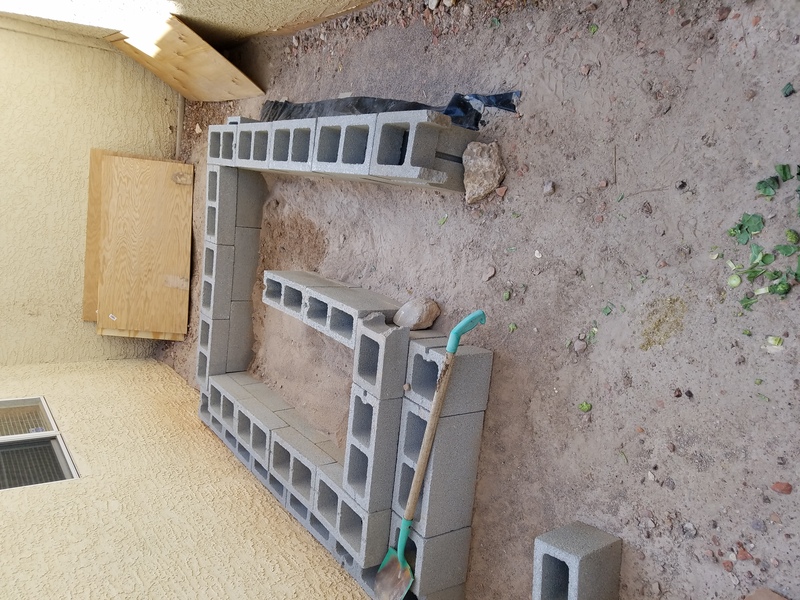 Koopa's old burrow wasn't big enough, so I had to do a whole new one from scratch. I had to build a large, above-ground burrow for Bubbles. I was hesitant to take him in at the time because my girlfriend and I were also in the process of shopping for a new house. We were starting to outgrow the small, two-bedroom house that I owned, were running out of space to store our stuff, and barely had the space to entertain more than just a handful of guests. We wanted to try to find a place that would give us the space to have large dinner parties and board game parties, and which would provide us with enough space to hopefully expand out family a little bit more. However, we were conflicted about the process. We wanted to try to stay in the same area because our kid was right across the street from one of the better elementary schools in the city, and would also be very close to a good middle school when she gets older. The new build homes that we liked (and which were affordable) were all very far away at the edge of town. We were about to give up, when we finally found a place that was somewhat close to our old home, put in an offer, and started going through the inspection and escrow process. However, the inspection revealed some annoying defects and some shoddy work that was done by the people who had flipped the house. The sellers were unwilling to make the requested fixes or bring down the asking price, so that home fell through. We got lucky, however. The same day that we withdrew the offer on that house, another resale came up that was very close to our old house -- practically in the same neighborhood! We moved on it instantly. It passed all inspections with flying colors, as the previous owner had taken immaculate care of it. Plus, it was about fifty percent larger than the first house we offered, and was only marginally more expensive! Win, win! We moved in this past summer, and are still trying to find new furniture. Bubbles came with us. 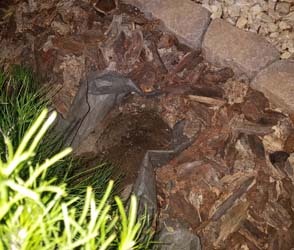 Sadly, he didn't get much bigger of a back yard, and now I had to go through the process of building a new burrow for him, again. The old burrow that I had worked so hard on was only used for a single year. 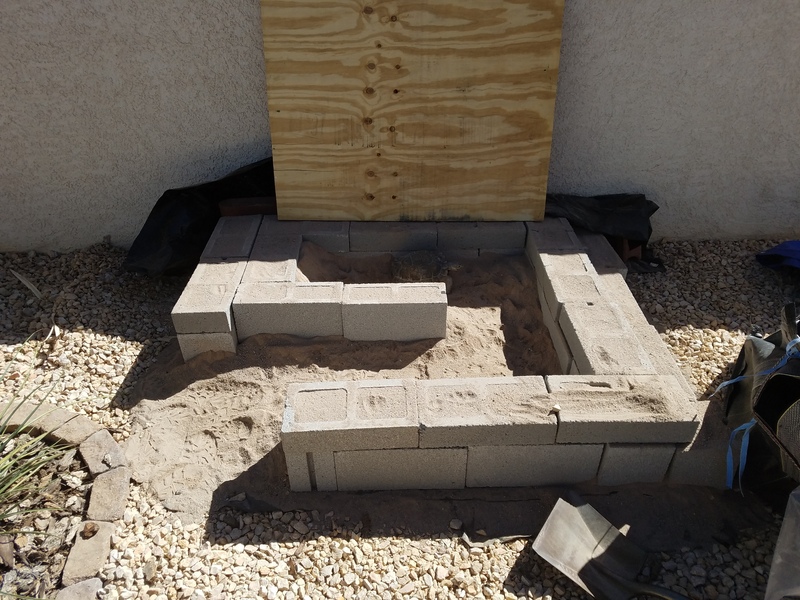 It was too damned hot for me to build a full scale burrow in the summer though (we regularly have temperatures over a hundred and ten degrees Fahrenheit). Instead, I put together a temporary shelter on the covered patio and made sure to leave out plenty of water for Bubbles. 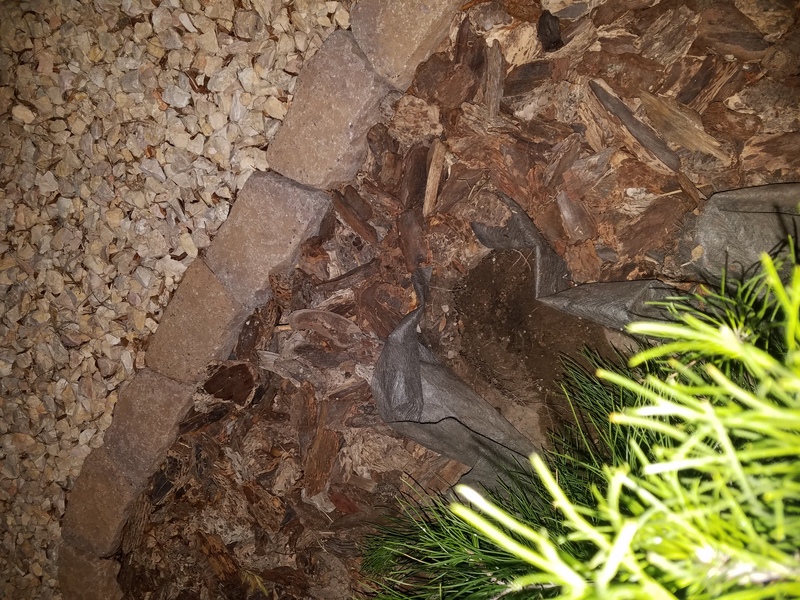 He didn't seem to be too happy with it though, as he would regularly find some random corner of the yard to sleep in, and he started to dig up the planters to try to make his own burrow. For being such slow-moving creatures, they sure can dig fast! In a single afternoon, he would be able to dig out a space large enough for him to crawl into. and got himself awfully dirty doing it..
As soon as the temperature cooled down a bit, I started work on the new burrow. 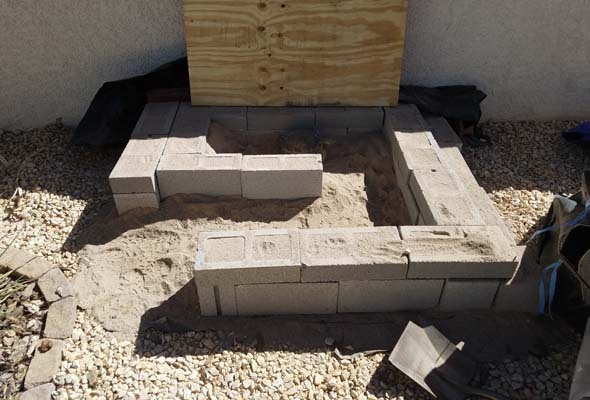 I put down the plywood floor, and lined up bricks to make a U-shaped tunnel. 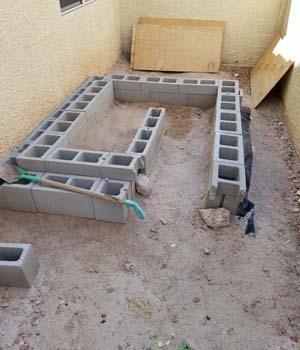 I then filled it with landscape soil and covered it with another piece of plywood. Even though it wasn't finished or insulated yet, Bubbles seemed to be much happier with this shelter! The dirt allowed him to fulfill his instinctual desire to dig, and he routinely slept in it. Over the next two months, I've been slowly improving and insulating the burrow with more soil over the top. It's been slow going however, as every time I go to the nursery to buy more soil, they only have one half-ton bag available. So even though I'm borrowing my sister's truck, which has a full ton payload capacity, I'm only able to do half a ton at a time. If this winter is anything like last winter (which was very mild), then I'm in no rush to get the burrow fully insulated. However, I want to do it sooner rather than later, just in case a winter storm rolls in or we have a hard freeze over some night. 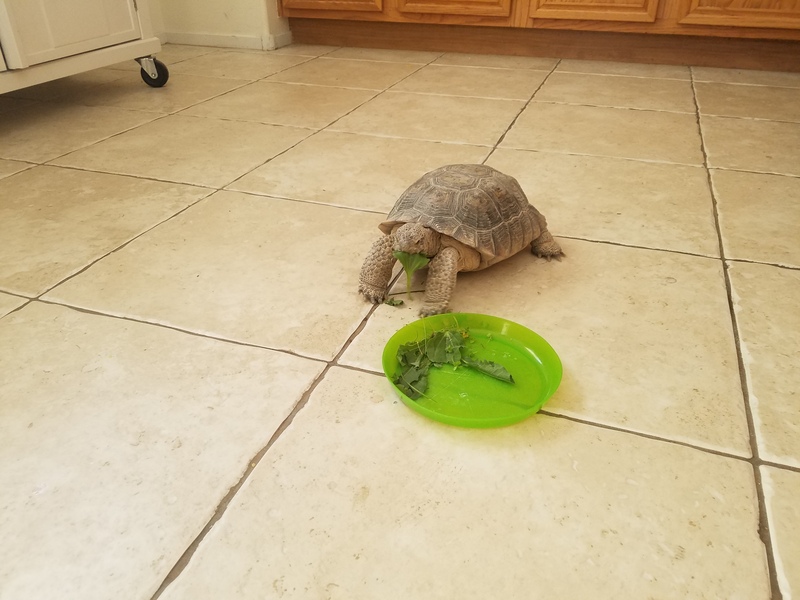 We have a tortoise in the house once again.